﻿Myths abound when it comes to the late works of important composers. It is debatable as to whether this is due to their timelessness, or their often extensive form, which makes great demands on the listener, or simply the supreme skill with regard to the composer’s own musical language, which is demonstrated in mature works. It is commonly understood that a performer of late works should treat them with due respect and possess an exceptional command of his instrument. 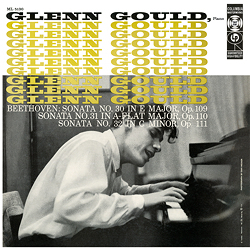 But not so with Glenn Gould, who at the tender age of 23, shortly after his recording debut for the Columbia label of Bach’s Goldberg Variations, dared to perform Beethoven’s last three Piano Sonatas.